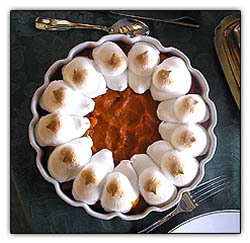 We took traditional pureed baked sweet potatoes* with minature marshmallows and -- as Emeril would say -- kicked it up a notch! with a circle of Peeps (main ingredient: sugar). "Which came first, the Peep or the egg?" We found the answer in our experimental Easter Kitchen at Goomp's yesterday. Ready for the Big Test, Peeps roost at attention. 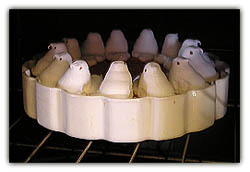 After baking the puree at 375o for 30 minutes, we added the festive birds and put the casserole back into the oven for 5 more minutes. In they go, holding their heads high. Would they hold their shape, or would they dissolve into pools of marshmallow fluff? First came the Peeps, then the eggs. Under extreme temperature conditions, they puffed up into ovoid versions of themselves. Well look at that! The Peeps are still roosting but have lost some of their definition, looking more like eggs than chickens. Losing some of their puffiness as they cool, the Peeps return to an approximation of their original chickeny selves. Taking pride of place on the Easter Table, the Peeps win the hearts and minds of all for their sheer cuteness and fortitude under duress. 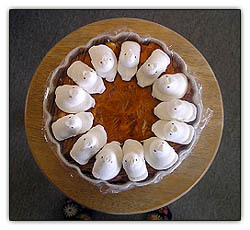 All eyes are on Sweet Potato aux Peeps, newest star in the Easter table constellation. Once on the plate and in the mouth, a pleasant surprise. 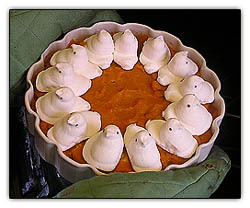 Still retaining their outside shape, the Peeps are liquid inside, spilling out and blending deliciously with each forkful of sweet potato puree. A holiday tradition is hatched. 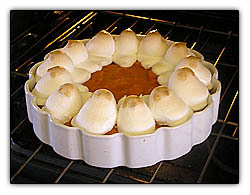 *Sweet Potato aux Peeps: Bake 8 sweet potatoes 1 1/2-2 hours at 350o till soft. 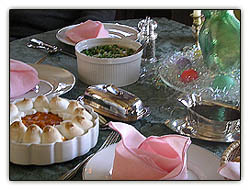 Remove flesh and puree in batches in food processor, blend in 1/4 cup brown sugar and 1/2 cup miniature marshmallows, and pour into 9" quiche-type casserole dish. Bake 30 minutes at 375o. Arrange peeps around edge and bake 5 more minutes. Yum, I've got to try that recipe. Don't know how I missed this post. Thank you so much, I have been meaning to try this for years but was unsure of the results and always forgot to do a test run pre-holiday. My "peeps" thank you! Ah, the sweetness.